Can we prevent archaeological looting? The American Association for the Advancement of Science (AAAS) analyzed satellite images to document the destruction of Syria’s World Heritage sites as a result of ongoing warfare. The images here show the old city of Aleppo on December 6, 2011 (top), and on July 14, 2014 (bottom). One can observe that the roof of the Suq al-Madina has been damaged (green arrow), the minaret of the Great Mosque has been destroyed (red arrow), two craters have developed on the eastern wall of the mosque (blue arrows) and several structures in the vicinity have suffered heavy damage (yellow arrows). Images: ©2014, DigitalGlobe Analysis, AAAS. Archaeological looting is a global issue that threatens the preservation of our shared cultural heritage. In the Middle East, archaeological looting and the deliberate destruction of archaeological sites and monuments amid ongoing warfare have captured international attention. Antiquities looted from sites in Syria and northern Iraq and subsequently trafficked are one of the main sources of funding for the Islamic State, the Sunni extremist group referred to as ISIS or ISIL. What, if anything, can be done to protect these objects and sites? In “Is It Possible to Protect Our Cultural Heritage?” in the March/April 2015 issue of Biblical Archaeology Review, BAR editor Hershel Shanks examines local and international efforts to address the archaeological looting and devastation of sites in the Middle East. In Shanks’s view, these efforts, while laudable, have thus far been ineffective in protecting cultural property. Continuous conflict has left thousands of archaeological sites in Syria and Iraq—including those of the Bronze, Iron, Greek, Roman, Byzantine and Islamic periods—vulnerable. The culturally diverse ancient city of Dura-Europos, where one of the earliest Christian house-churches was discovered, has been heavily pillaged over the past few years. In July 2014, ISIS militants blew up the mosque that housed the traditional tomb of the prophet Jonah in Mosul, Iraq. According to a report from September 2014, five of the six World Heritage sites in Syria “exhibit significant damage” due to ongoing warfare. Cultural heritage experts believe that ISIS militants have been responsible for much of the archaeological looting going on in Syria and northern Iraq since the rise of the rebel group. Criminal networks seeking to profit from the turmoil, however, are also to blame. The Art Newspaper reports that there has been a 133% rise in Syrian objects imported into the United States. The aftermath of archaeological looting is often visible in the landscape in the form of lunar-like craters. Seen here are craters at an ancient cemetery site southeast of the Dead Sea in Jordan. Photo: Hershel Shanks. How effective would the placement of guards be for on-the-ground protection of vulnerable archaeological sites in this region? A story recounted in the New York Times offers a glimpse of the danger of such a situation: Maamoun Abdulkarim, director general of antiquities and museums in Damascus, relayed the tragic fate of a ranger who guarded several sites in the eastern Syrian city of Deir al-Zour—he was beheaded. There are myriad efforts by professionals, government organizations and concerned citizens to address the loss of cultural heritage in conflict areas. The Safeguarding the Heritage of Syria Initiative is building a database to document the destruction of Syrian sites and artifacts—thus preserving at least the memory of cultural treasures. The Combatant Command Cultural Heritage Action Group trains U.S. military personnel to protect cultural property during operations. The International Council of Museums published the Emergency Red List of Syrian Cultural Objects at Risk to make art and heritage professionals and law enforcement officials aware of looted Syrian antiquities that may resurface in the art market. In the face of this bleak—but frank—sentiment, it is nevertheless commendable that greater awareness is being raised for the value of our shared cultural heritage. Greater awareness can inspire more vigilance and better ideas for the protection of cultural property. Learn more about the archaeological looting of sites in the Middle East by reading the full article “Is It Possible to Protect Our Cultural Heritage?” by Hershel Shanks in the March/April 2015 issue of BAR. 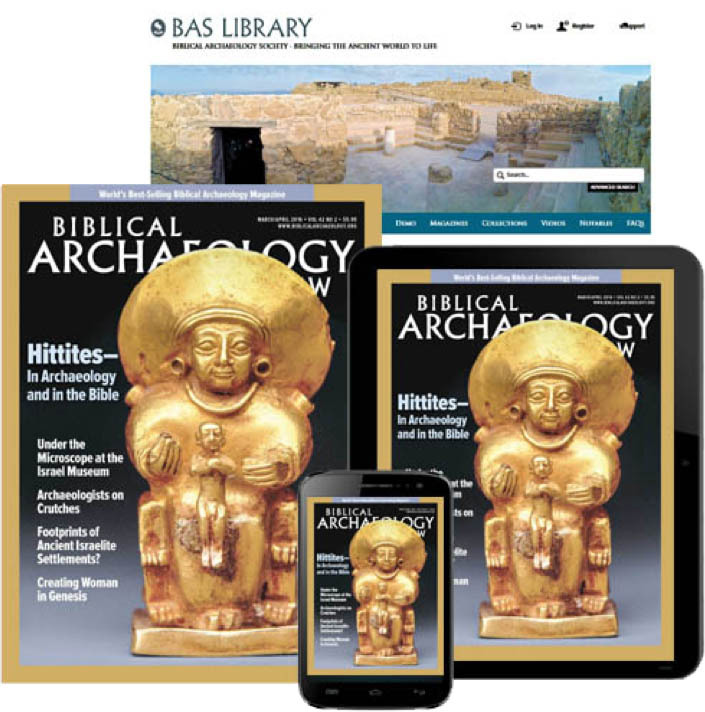 BAS Library Members: Read the full article “Is It Possible to Protect Our Cultural Heritage?” by Hershel Shanks in the March/April 2015 issue of Biblical Archaeology Review. This Bible History Daily feature was originally published on February 23, 2015. Gwen is correct. Look how statues and such across the old South are being removed on the grounds they are offensive. See how the Ten Commandments fare, too. If one person is offended, the object is removed for fear of a multi-million dollar law suit. In the United States, the heckler gets his veto in. Cultural objects be damned. Because nobody said a word 10-15 years ago about the Muslim desecration of the Temple Mount with Bulldozers and ditch digging to put in power lines, the IAD, Israeli Antiquities Dept just sat like beaten dogs and said nothing nor the Supreme Court. So now you wonder why they feel free to destroy what they wish. Like the Buddhas that the Taliban got away with destroying and the world shut its mouth. Mida Keneged Mida. Nobody did anything but gave useless talk so neither today will anybody say anything. The ONLY way to stop such destruction is to use Napalm and Phosphorous bombs on identified Daesh/IS forces occupying the vicinity of these World Heritage sites. Napalm and phosphorous are terrible weapons, designed to kill victims by burning deep into the skin, but it is justifiable against such greed-driven extremists such as Daesh. These incendary bombs are not high-explosive and theerefore will not cause damage to the entirely fireproof remains above ground such as sandstone columns, pediments, ashlars, etc. Other alternative weapons of annihilation which could be used include gas weapons or even the Neutron Bomb, which was designed by the Americans in the 1980’s to kill enemy forces but to leave cities, buildings and infrastructure in enemy occupied territory intact. Just ONE Neutron Bomb could annihilate ALL of Daesh forces occupying a given area (e.g. Raqqa), but is best targeted where a minimum of innocent people may be also killed. Many of these weapons, such as poison gas and Napalm/Phosphorous, may also have to be un-banned by some kind of temporary suspension of international treaties against Chemical Weapons, but I know that the majority of those concerned about priceless cultural treasures will be OK about that, and limited return to use of Chemical Weapons will just have to be tolerated as a reality in the 21st Century. Finally, safeguards AGAINST EVER using Biological Weapons will have to be STRENGTHENED, as these are far more dangerous than any chemical weapon in terms of ‘containment’. Expect an U.N. condemnation, of course, blaming Israel- as that is what the U.N is best at. 450,000 dead in Syria, countless archaeological sites destroyed either deliberately or as a result of war. But Israel which protects all its archaeological sites will be some how be blamed for damaging Palestinian sensibilities, whatever that is, and using excessive force and killing innocent Palestinians, that is errorists. The sooner we exterminate Daesh, Al Qaida, their ilk and all their supporters, the better chance the artifacts can be saved. James: The US is not safe anymore, look what they are doing to own history with the same sentiment of being “offended”. It is a disgrace that one culture rooted in violence and destruction is able to move so quickly to destroy the beauty of any of those who do not fit their personal agenda. It is getting bad here and will only get worse unless sudden enlightenment strikes. This seems unlikely. I am saddened by the insane destruction of antiquities in Iraq and Syria. We saw the same in Afghanistan a few years ago. These are monuments I will never be able to see in person. The Middle East is so unstable that all antiquities there are at risk. If this iconoclasm spreads, then antiquities in many Asian countries are also at risk. The United States is the safest place for antiquities to reside, both in museums and in individual collections. In the elite academic world, all who own antiquities are wealthy and are worthy of disdain. This is untrue. There are many who sacrifice to own a part of the past. Rabid zealots would deny them the right. ISIL destroys what it can’t sell. At this point, is it better for them to sell them illicitly or to see the antiquities be destroyed? Sadly, I don’t see a good end to any of this; Kerry says we’re determined to protect the cultural heritage in peace, but there isn’t, and isn’t going to be, any peace. The same goes for both sides; if they have no respect for human life, of what value are the fruits of that life, other than as a profit center, for which I have no doubt there are equally callous buyers who just want to own cultural artifacts as if they deserved them.